So, while I have no earlier numbers to compare with, in contrast to the US, France and Turkey, the 18-28 age group in Germany is clearly below 50%. Additionally, the 13-17 age group is weaker than in the US or France, where it encompasses more than 15%. The German age distribution resembles the UK the most. If you break it down in single years, you get the following distribution. The largest age class is 25. The high number for 65 probably should be an artifact. Here’s another competitor in the market for more or less intelligent blog aggregators: Regator. While Technorati has become nearly unusable in the last few months, this new startup not only looks very neatly design – well, we could argue about the crocodilealligator, because in Germany, we once had a very infamous hit by “Schnappi, das Krokodil” – but also seems to deliver the right amount of pseudo-intelligence I’ve been missing in lots of other aggregators. The screenshot displays how Regator shows the two latest posts on this blog. If you click on “Kinda related” (doesn’t sound too obvious btw), Regator shows a few entries that are also on this topic. And they definitely are more than just “kinda” related. For example, my recent entry on McLuhan is connected with other blog posts that connect McLuhan’s thoughts with the recent developments in social media and one or two of those entries really gave me new thoughts, I would have liked to have known before I wrote the article. Other features that are nice for this kind of service: you can rate posts up or down, there’s a list of hot topics, you can comment on the posts, you can create a hot list of your favorite blogs or channels etc. The only thing Regator does not offer is social network functions. You can’t add friends. Or rather: You don’t have to worry about reconstructing your network of friends on yet another platform. I like that. But it also means that there is no way to weighten ratings by people you trust. Here are two new maps I created with Pajek (which unfortunately cannot display graphics as nodes) using the Crunchbase API. 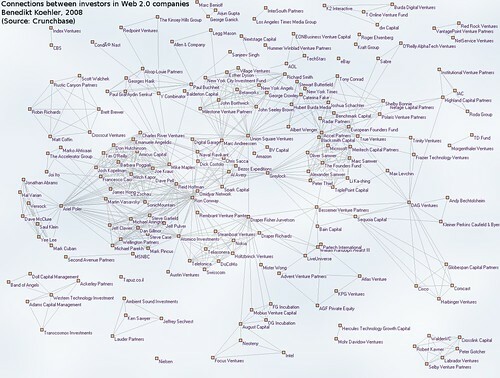 This time they are about the connections between a number of Web 2.0 startups by their common investors and between these investors. If, for example, the same financial organization or person is investing both in Twitter and Tumblr, there is a link between those two companies. In this case there are even two companies, Union Square and Spark Capital investing in both of them (click to enlarge). Of course, investments are made out of many different reasons. But I guess, with caution, you could interpret the map this way: people who believe that startup A has a great vision and could be successful, also feel the same way for startup B. What do you think? 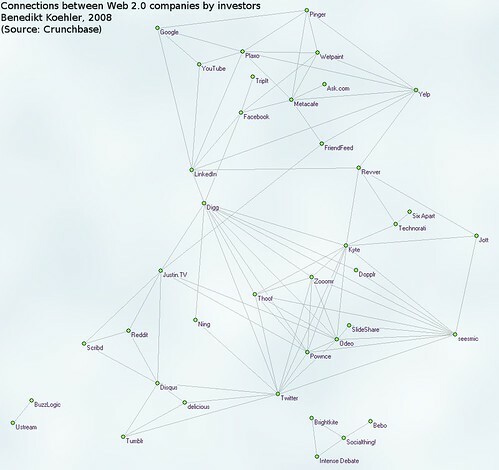 If you look at the same data the other way around – best thing about two-modal networks is that you actually have two networks to examine -, you get a map of the connections between the investors. Two investors funded the same startup? Let them be connected by an edge (click to enlarge).